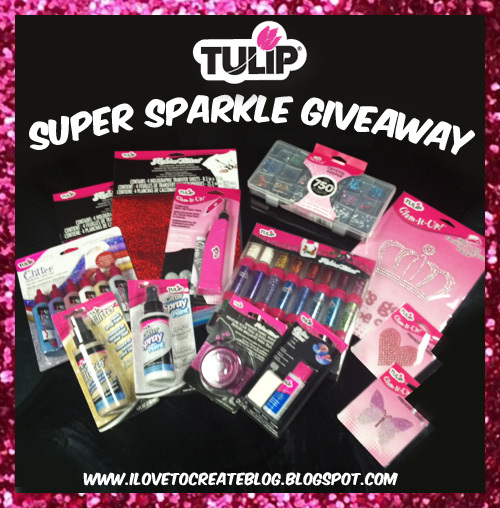 iLoveToCreate Blog: Enter to win the Tulip Super Sparkle Giveaway! Enter to win the Tulip Super Sparkle Giveaway! Here at iLoveToCreate, we love pink and we love a lot of bling! So we decided to offer up a big, fun prize pack of Tulip Fashion Glitters, Glam-it-up Crystals, Glitter Fabric Sprays, and more valued at over $125! One lucky recipient will win this whole assortment of Tulip supplies! Enter to win below! I would like some sparklies on tshirts! I add Glam-it-up Crystals and glitter to my projects. Everything is better with some glitter on it!!! A project isn't complete with out some glitter or bling and oh I am in heaven with PINK...I have to add one or all of these to my projects. What a spectacular giveaway. I use glass beads and metallic paint to add sparkle to projects. Ooo ooo pick me pick me!!!! Consider this one of my official entries! I don't tweet but I can do the others! WOW! This ia a lovely sweepstakes! Love Tulip products and use them ALL the time! Would love to win this package of goodies ,all of my nephew's children are in school. I am the only crafty person around them and we could have such fun. The oldest is 6 yrs old the youngest just turned 3 and is autistic, so I think it would really help her out, I have seen work done by the autistic community and it would be a joy to help her learn to create HER OWN THINGS in her own world.